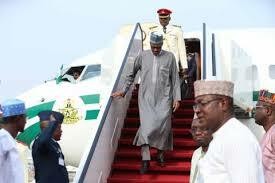 President Muhammadu Buhari on Saturday returned to Nigeria after a 10-day vacation London, United Kingdom. Mr. Buhari who arrived the Nnamdi Azikiwe International Airport Abuja was welcomed by top government officials, including the Secretary to the Government of the Federation SGF, Boss Mustapha, Kogi State Governor Yahaya Bello among others. Traditional dance troupe was also at the airport to welcome the President. Meanwhile, President Buhari has commiserated with the government and people of Ghana over the passing of former United Nations (UN) Secretary General, Kofi Annan, in the early hours of Saturday. Buhari, in a statement issued by his Special Assistant on Media and Publicity Mr. Femi Adesina stated that the President called President Nana Akufo-Addo of Ghana from London and said all Nigerians as well as ECOWAS member countries share in the deep loss, considering the strategic influence of the former scribe in global affairs and his vision for the repositioning of the West Coast and Africa. “As the first elected staff of the United Nations to lead the world organisation and first African to win the 2001 Nobel Peace Prize jointly with the United Nations, the President noted that Annan’s humility, nobility and love for humanity set him apart for global greatness, achieving recognition and commendation for the reform of the United Nations’ bureaucracy and multiple interventions to bring peace to the world’’ the statement said. The President restated that Annan’s origin and home will always be traced to Ghana, but his exceptional leadership roles, humanitarian spirit and contributions to global peace and development will remain indelible in the history of the entire world, especially the efforts to combat HIV/AIDS in Africa and launch of the UN Global Compact.